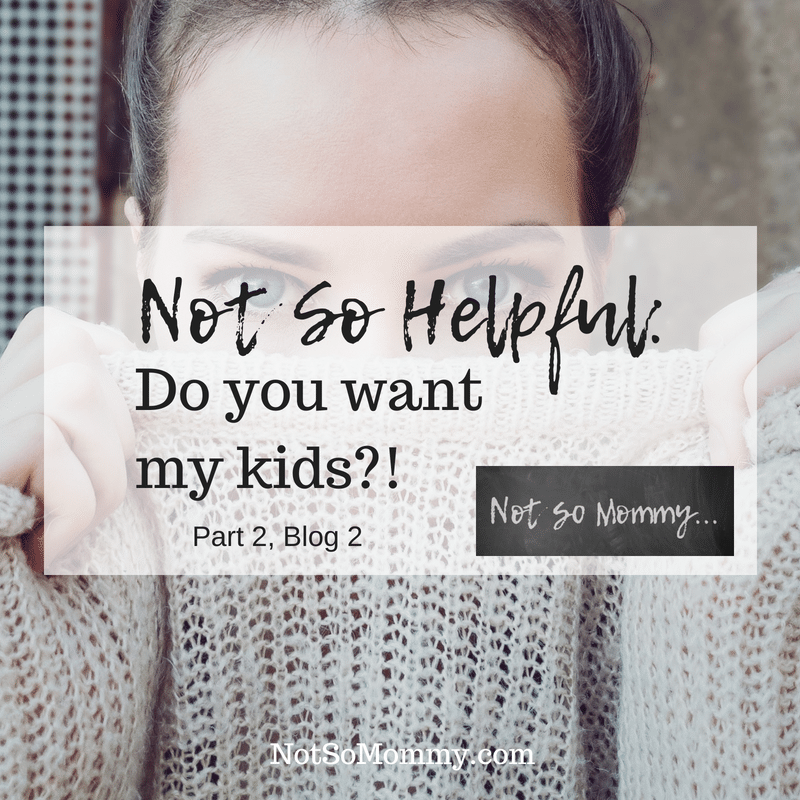 Last week, we talked about the not so helpful joke, “You don’t have kids?! 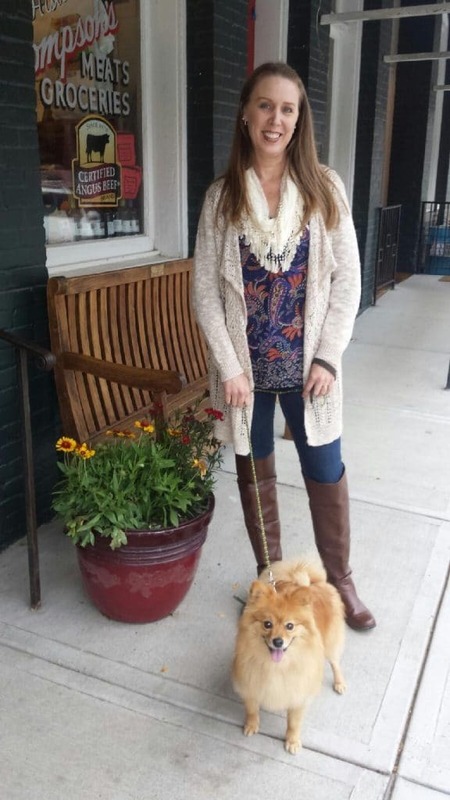 You’re so lucky!” Unfortunately, this quip is often followed by “Do you want my kids? !” Other versions being “Do you want to borrow mine?” and “Are you sure you want kids? !” And inevitably, the parent laughs at their clever little remark. Is “Do you want my kids” really that funny? 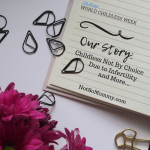 We’ve already discussed how these seemingly innocent words dismiss the struggle and pain that the childless not by choice have gone through. But I particularly dislike the “do you want my kids” comment because I find it so sad for the person’s littles. Several years ago, I was at a gathering when a lady walked in and huffed, “I’m so sick of being a mother! I just want to sell my kids!” This was met with light-hearted laughter and “What did they do” questions. A couple of things… One, the lady knew that Dane and I couldn’t have kids. Two, so did the other people in the room. That’s why I think the jokes may be the meanest. Because how do I explain that this isn’t funny because it is so completely rude to the infertile and childless not by choice without completely bringing down the mood and looking like a stick in the mud? It’s awkward. So, I’m going to ask you to know your audience. 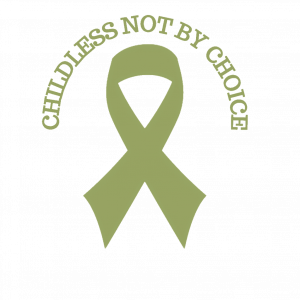 If you realize that someone is childless not by choice, please don’t joke about giving your kids to them. And if you’re not sure whether they are childLESS not by choice or childFREE by choice, assume they are childLESS. That way, you don’t risk dismissing the struggle, the pain of the childless not by choice, with such an inconsiderate remark. 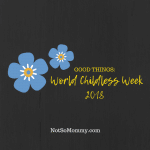 World Childless Week 2018 begins next Mon, 10 Sept! This resonates me. In my local supermarket, after exchanging pleasantries with a stranger about choosing food, which involved me saying I didn’t have children, she offered me hers. I said ‘Yes’ with a totally serious face. She recoiled from me in horror and I just walked away. I have no idea what was going through her mind, did she think I was going to steal them from her!? It’s impossible to react to this hurtful ‘joke’ in any way other than what they expect – a weak laugh, which makes me feel manipulated – because if you do react differently, walk away, say ‘yes’ etc you ‘offend’ them. They become outraged that you didn’t comply with their attempt to make a joke out of your situation. It’s a minefield out there isn’t it! It really can be a “minefield,” as you say. I find it very brave that you spoke your truth and didn’t just go along with this “joke” since it truly isn’t funny to those of us who are childless not by choice. As we continue to speak up, I believe more will become educated so that (hopefully) others don’t have to endure these hurtful comments (or at least not as often).